Most retail financial institutions have spent the better part of the last decade shooing people out of costly branch networks, choosing to push online, mobile and paperless solutions over one-to-one, personal interactions. Most banks and credit unions have done what they can to keep consumers out of branches and reduce transaction volumes. That is most, but not all. DBS Bank in Asia and Dupaco Credit Union in the U.S. are actually rewarding people for making frequent branch visits rather than discouraging them. The two financial institutions are among a growing number of retail banking providers wondering how they might exploit GPS-based social media platforms such as Foursquare. 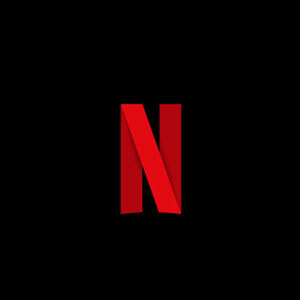 Take a look and see what they’ve come up with. Just remember, if you try something like this, make sure you’re reinforcing the consumer behaviors you’d like to see. It’s okay to structure and hold fun contests where people chase prizes as long as you are clear about the strategic advantages. Food for Thought: Besides driving branch traffic, how else can banks use mobile social media check-in platforms to build business? 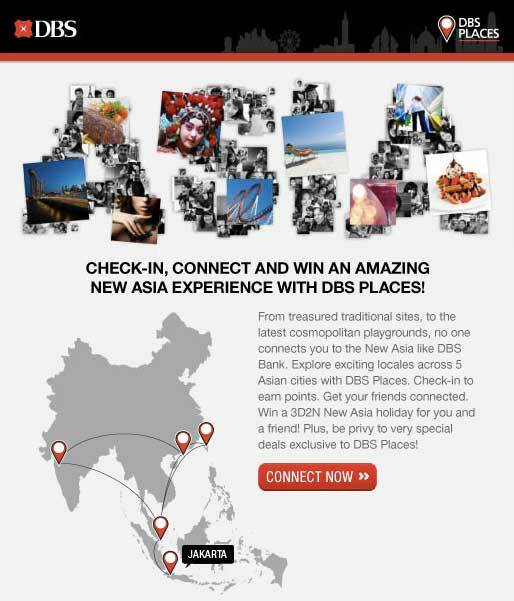 DBS Places is a relatively complex promotion for the bank’s Asian customers built around Facebook Places. Facebook Places is a GPS-location based technology that lets users virtually “check in” online, so they can share where they are in real-time with friends and family. Participants checking in a DBS Bank branch through its Places Facebook app will be able to earn points and redeem merchant deals. The campaign is open to anyone who owns a mobile device. 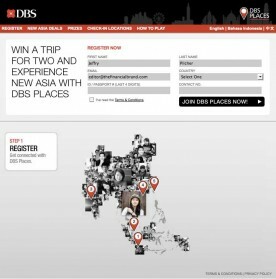 Participants in the DBS Places promotion earn five points for checking in to a new DBS branch location. 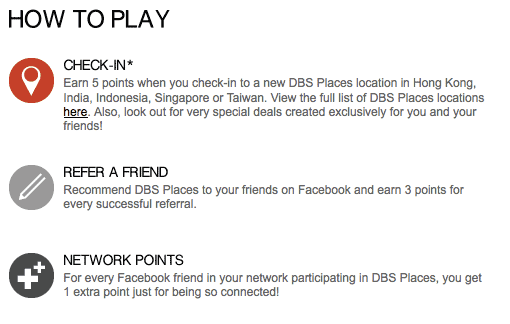 Users can earn three points for every Facebook friend they refer to DBS Places. Users also get one extra point for every Facebook friend in a network participating in DBS Places. The month-long promotion is running in five countries: Hong Kong, India, Indonesia, Singapore and Taiwan. There are around 20 locations in each country where participants can check-in to earn points. The top scorer earning the most points in each country will get to take a three day, two night holiday for two at the Asian city of their choosing. 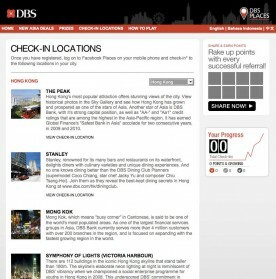 Users can see how many points they have accumulated and how many check-ins they’ve made through the DBS Facebook application, where statistics are updated in real time. There are no DBS locations with more than 50 check-ins, and many branches have no check-ins, or only a small handful. Key Question: What does the financial institution accomplish strategically by sending people on a branch scavenger hunt? Why does a bank customer need to know where 20 different branches are located? DBS took three months to develop the campaign, which included ads on Facebook to generate additional interest. The contest ends September 5. In the middle of the DBS promotion, Facebook quietly killed its Places feature, although DBS will be able to conclude its campaign without interruption. The fact that Facebook pulled the plug on Places suggests that consumers’ appetite for GPS location-based social media may not be as strong as marketers had originally hoped. One explanation might be that people don’t really feel like letting everyone in the world know exactly where they are all the time? 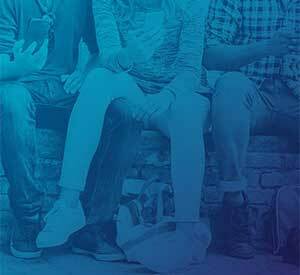 In August, Dupaco Credit Union launched a new promotion centered around the social media application Foursquare. 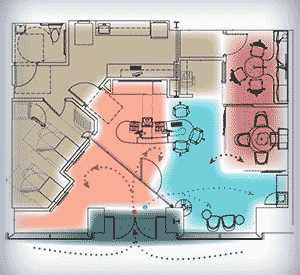 Foursquare is a free application for mobile devices utilizing GPS technology. Foursquare users can use the service to check-in at various locations, find new places, accrue badges and unlock special rewards. Once a user has signed up, they can use Foursquare to check-in while visiting different destinations — including Dupaco branches — to start to earn points and rewards. Participants in Dupaco’s Foursquare promotion get a free koozie on their first check-in. Every Dupaco check-in enters users in a weekly drawing for a $50 gas card. Those users who visit a specific branch more than anyone else will have the title of “mayor” bestowed on them for that location. 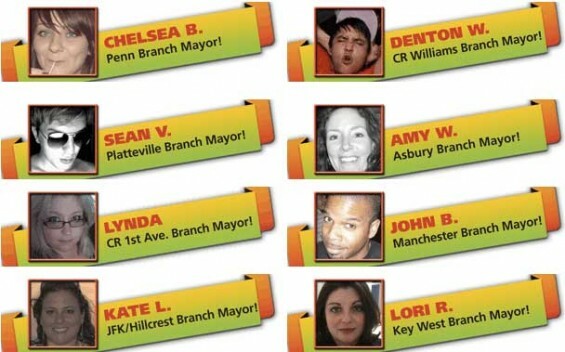 Branch mayors get to have their names featured on Dupaco’s electronic billboards and branch signage. It takes as few as five check-ins to be the mayor of some Dupaco locations. One of Dupaco’s mayors has checked-in to her favorite branch some 26 times over the last 60 days. This article was originally published on August 30, 2011 . All content © 2019 by The Financial Brand and may not be reproduced by any means without permission.